Midlo Scoop sponsored a Holiday Decorating Contest to help spread the holiday spirit the halls of Midlothian High School. With the theme Holidays Around the World, teachers and students began decorating upon their return from Thanksgiving break. The judging took place on Monday, December 11, 2017, and Mrs. Tully announced the winners at the annual Faculty Holiday Luncheon on Wednesday, December 13, 2017. Midlo Scoop would like to thank all of the faculty, staff, administration, and students who participated in the fun this year. 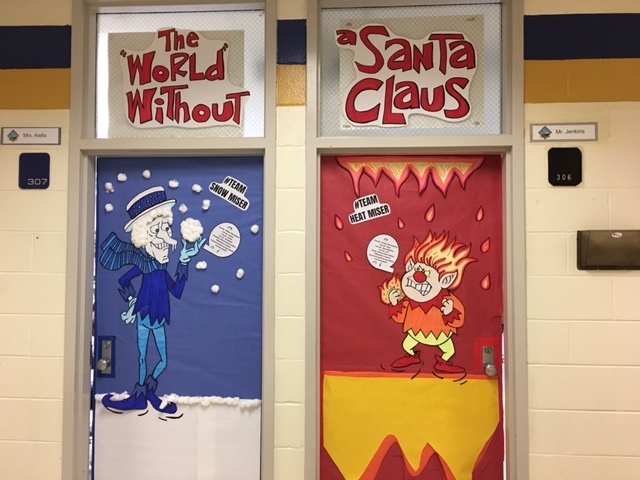 Mrs. Rachel Aiello and Mr. Scott Jenkins received Best Overall for their tribute to Heat Miser and Cold Miser from the holiday classic, A Year Without a Santa Claus.